Steam the asparagus for 7 minutes, ensuring they remain al-dente. Meanwhile, to prepare the sausage sauce, sauté the shallots, garlic and parsley with a little olive oil in a heavy based saucepan. Add the sausage and wine and cook on a medium heat for approximately 1 hour. To prepare the Parmesan fondue, melt the 200g of grated Parmigiano Reggiano with the cream. When the mixture has thickened, add the egg yolk and stir. 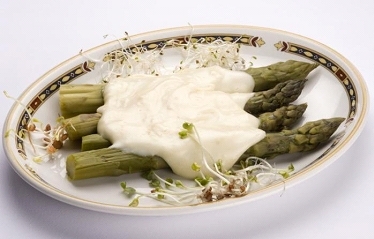 To serve, layer the asparagus, sausage and Parmesan fondue in a heat-proof dish and cook in a hot oven for 15 minutes. Asparagus with Sausage and Parmesan Fondue is one of the many recipes using the wonderful foods that you can find in the Emilia Romagna region of Italy. These range from the delicate prosciutto of Parma to the distinct balsamic vinegar of Modena, but cheese is where this region really shines.